There was a time when high-rise buildings were the natural enemy of community activists. They were practically seen as the devil’s spawn – local character-destroying intruders which were the work of supposedly money-hungry developers. However, the recent statistics shows that, surprisingly, there may be some common ground when it comes to high-rise buildings between your average neighbourhood NIMBY and polished property industry tycoon. To get the picture, you’ve first got to look at the stats. And the stats show the level of high-rise apartment construction across Sydney is unprecedented. According to the Department of Planning and Environment’s quarterly housing report, some 59 per cent of approved Sydney homes in the last three months of December 2013 were in buildings four storeys or higher. The other 41 per cent of homes were in other medium density types or detached housing. This is the highest quarterly percentage of approved high-rise apartments since 2012, when the Department began reporting on dwelling approvals by building type. Somewhat surprisingly, it is councils outside of the city centre that are leading the high-rise charge. Parramatta was the biggest producer of approved housing in the December quarter and 716 of its 893 new dwellings were in buildings over four storeys. Next was Liverpool (391 out of 608 new dwellings in buildings above four storeys), Hornsby (460 out of 566 new dwellings above four storeys) and Burwood (542 out of 562 new dwellings above four storeys). By my calculations, in the order of 48 per cent of all approved Sydney dwellings are now in buildings four storeys and up, compared to 45 per cent last year. So what has this got to do with the NIMBY versus developer debate? Well, it’s got to be remembered that the worst excesses of high-rise development – and therefore a key genesis of the NIMBY movement – happened in the 1960s and 1970s. At that time, planning controls were less advanced and therefore high-rise developments tended to pop up right next door to single-dwelling homes simply because a site was large enough, or because it had views, rather than through any community-based planning. Councils then tended to react to this trend through blanket height limits and controls – for instance North Sydney wacked a two-storey limit on new housing for most of the 1980s and 1990s. The main instigator of this was former mayor Ted Mack, whose home was over-shadowed by one of these high-rise buildings. 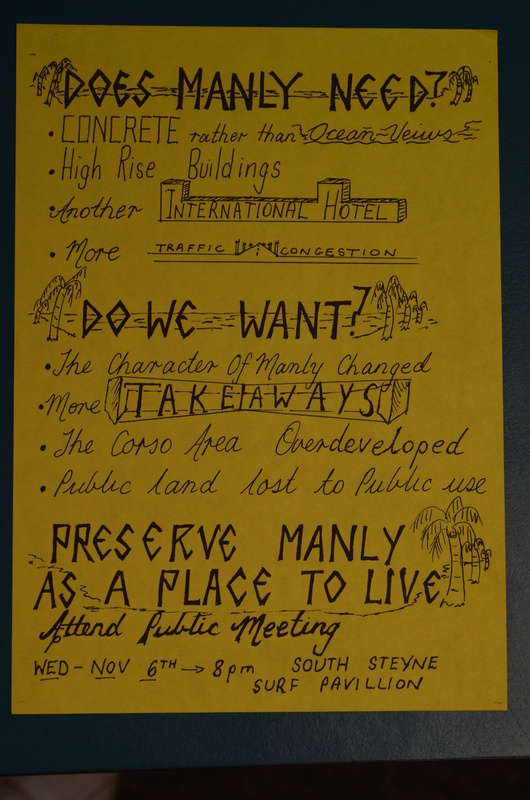 Manly activists also launched a huge and ultimately successful campaign against high-rise development on Manly beach (see flyer below). 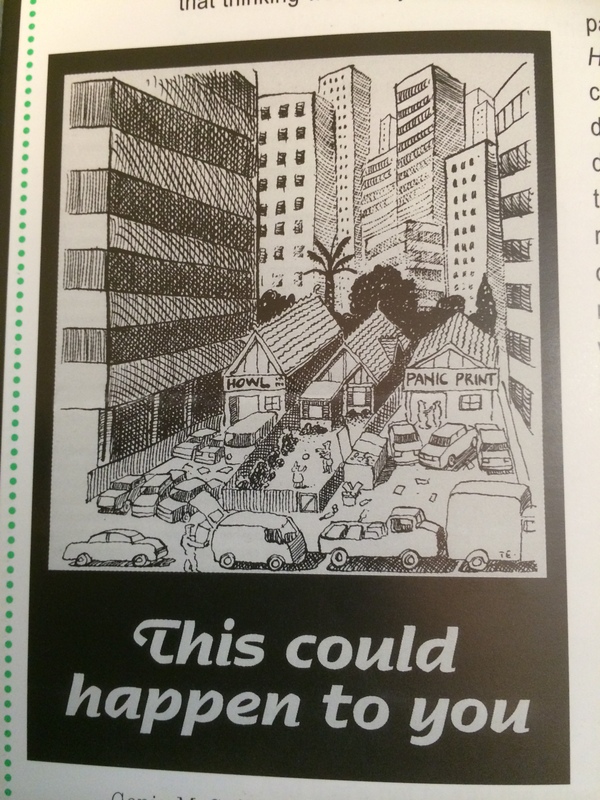 Consequently, the number of apartments produced across Sydney nosedived during the 1980s. The NSW Government in turn responded by introducing an urban consolidation policy and pushing housing targets on councils. The councils, and to some extent the government itself, then realised that perhaps it was easiest to respond to these targets by clustering the new housing in a small area – such as high-rise housing in a town centre or former industrial estate – thereby protecting most suburban areas from any increased density. By doing this, the councils realised they could avoid a more hostile reaction from residents and what’s more many developers didn’t mind the views they could sell by building higher, which they would not have got from smaller-scale apartment projects. In the book Voices of a Landscape, former North Sydney mayor Genia McCaffery – who began her political life as an anti-development campaigner – explains the changed approach from the 1980s/1990s under former mayor Ted Mack to the 2000s. Ted’s approach – and I guess he was starting from the point that all of North Sydney was zoned for flat buildings – he brought it all down to townhouses,” Ms McCaffery said. But I think we’ve had to approach it in a different way because if we don’t allow some high density buildings in areas like Crows Nest, what we end up with is getting the density that we could get in one or two higher rise buildings spread across a whole conservation area. Just for fun, here’s Genia’s campaign flyer from the 1995 election so you get the idea. The recent statistics seem to indicate this is the approach which is being taken in Sydney. It is of interest to note that, in the December quarter, the highest proportion (32 per cent) of dwelling completions were in big developments of more than 100 units. In other words, it is the big high-rise projects in concentrated urban renewal precincts such as Parramatta, Burwood, Wolli Creek, Green Square and Rhodes which are delivering the bulk of Sydney’s housing – not the old-style three-story walk up in the suburban street. You would also have to imagine that the fact that developers don’t need to get home warranty insurance for buildings of more than three storeys has also encouraged the high-rise approach. The Victorian Government has taken a similar approach, through concentrating high-rise development in small areas – in particular Central Melbourne – and introducing widespread suburban character zones where density increases are very restricted. Today, at an event in the Sydney CBD, the NSW Urban Taskforce launched a “towers near transport” initiative which also states that larger towers near transport may be more acceptable to people than increasing density right across all residential streets. Of course, many professional planners will tell you that lower-scale density is a smarter idea, given the concerns about the energy efficiency and potential greater privacy, wind and overshadowing impacts of high-rise buildings. There is no reason to doubt them. But planning typically involves politics and compromise and recent statistics and history have an interesting story to tell here. Are granny flats a housing solution?